This from the PaTH site doesn't inspire confidence does it? So yesterday I watched the press conference Malcolm Turnbull had with Michaelia Cash to flog the latest ‘coup’ of the AHA (Australian Hotels Association) agreeing to take on 10,000 PaTH Interns over the next 4 years. Yep, 10,000 young unemployed people between the ages of 15 and 24 can get the opportunity to work in a pub for 12 weeks to gain work experience. Unless a lot has changed since I was a young adult, it didn’t take 12 weeks to learn how to pour a beer, but anyhow, putting that aside, there are a lot of questions that need to be asked about this so-called deal that required a press conference featuring the Prime Minister no less to announce? It stands for Prepare - Trial - Hire. The Employer who signs up gets an unemployed kid to work for free for up to 12 weeks. 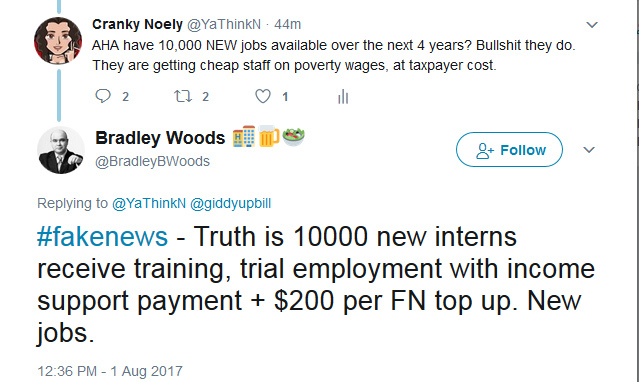 PLUS the Government – again, we the taxpayer – pay the business $1,000 PER intern “in recognition of the costs of hosting the internship”. IF the business does take on the Intern after 12 weeks, they are also eligible for a wage subsidy of up to $10,000. Sweet gig for the business huh? A FREE employer for 12 weeks, fully funded by the taxpayer. In the case of AHA we are talking about a sweet $10,000,000 taxpayer funded incentive on top of the free labour? Now, the only obligation an employer has to get this free kid is “a reasonable prospect of employment for the intern following the internship”, so I obviously queried, on twitter, the legitimacy of the AHA honestly having 10,000 jobs over the next 4 years would be available to these kids? Imagine my surprise when AHA (WA) CEO, Bradley Woods hits me up on Twitter with #FakeNews? I’m just a punter, not a journalist, so why the hell would he bother hitting up a punter on twitter just after he had his moment of glory in national media with PMs presser? Who the hell, besides spivs like Trump, use the term #FakeNews and expect to be taken seriously? Anyhow… I asked him quite a few questions, only to get them ignored in favour of him just dumping the https://jobsearch.gov.au/path/employers/internships link to me. Which of course I already had, this was why I was asking these questions in the first place. Sadly, due to the Liberals imploding over Marriage Equality, not one Journalist at the press conference asked any serious questions in regard to this AHA PaTH deal? Don’t get me wrong, as much as I enjoy watching the Liberals squirm, it is not helpful when it comes to any scrutiny of this program. On the 9th of July Terry Sweetman wrote a piece in the Courier Mail, “Opinion: PaTH program does little to provide young Australians with meaningful work” which was very illuminating as we finally got to see some figures as to the ‘success’ of this program? 82 out of 620? That is only 13.2% of kids actually getting a job? Obviously we don’t have any idea if those lucky kids actually got a job with the Business they did their internship with, or used the experience to get a job elsewhere? Either way, that is a really crap success rate? OK, now I’m not the best at maths but considering the above success rate, if we believe AHA aren’t going to flick staff they already have for the free labour – they say they have over 5,000 members across the nation – the taxpayer investment here is staggering. The Government is gifting the pubs of Australia $10,000,000 and 120,000 weeks of FREE labour. If AHA follow the same ‘success’ rate of 13.2%, we, the taxpayer, can expect this ‘investment’ to result in 1,322 kids getting a job in a pub, at the cost of $7,560 PER job. Now that is just the business incentive payment, remember, these kids are also still getting their welfare payment while they are doing the internship and a small top up of around $4 bucks per hour (figure quibbled over) so they Government can convince people it is not slave labour, and insurance costs paid for by the taxpayer? Personally, without some more detail this doesn’t sound like a good investment to me at all and I have lots of questions that I think need to be answered which neither the Government nor AHA seemed inclined to answer for me. Will this ‘deal’ be monitored? What are the repercussions for NOT employing any kids at the end of the internship? How many interns can an employer get and NOT employ at end before they are kicked off the program? For context – Every AHA member could get 2 interns, $2,000, and 24 weeks of free labour and still not employ one kid? Is there any onus on AHA to report stats to the Government? Who does the training? Are the AHA paying for the RSA and RSG Certification for these kids? Will anybody be monitoring that NO existing employee will lose their job or have their hours cut once the pub has access to free interns? Will anybody be monitoring that NO existing employee will lose hours that normally would incur a penalty rate to replace with a Free PaTH intern? PaTH site says “Your business cannot displace existing workers or reduce an employee's hours of work to make way for an intern.” BUT as far as I can, there is no monitoring of this? Now don’t get me wrong, I really do want kids to be employed, or at the least getting training to try to get a job. I live in an area where we currently have 23.5% Youth unemployment, now that is nearly a quarter of the kids living in Wide Bay? I’m not sure what the answer is? I know we need more TAFE and we need it to be free for unemployed kids. We do need incentives for Employers to employ kids in entry level jobs. BUT from what I can see with current programs, we, the taxpayer are spending squillions on PaTH and of course all the money going to Job Providers, and all these businesses seem to be the only ones benefitting from this taxpayer investment as youth unemployment keeps rising? Maybe we should remove the funding of these private providers, get back to a segment of Centrelink looking after it – who would then be answerable to Government (and voters), not at arms length like they are now – and expect some sort of results, be it training or kids actually getting jobs. At the moment, we seem to get a lot of press conferences, that like to brag about ‘jobs & growth’, yet are not getting any answers as to real results in this youth unemployment area? There appears to be little oversight on this programme (and Job Providers), there seems to be no transparency from the Government in regard to abuses of PaTH programme, full costs, nor accurate reporting of results? PS: We ALL need to start asking more questions of both the Government and Businesses benefiting from PaTH interns. I'm waiting for your reply. Are you prepared to publish a list of venues who partake in this scheme & the progress of the participants?